Mustique island is located in the St Vincent and the Grenadines country, the Lesser Antilles island arc, southeastern Caribbean Sea. 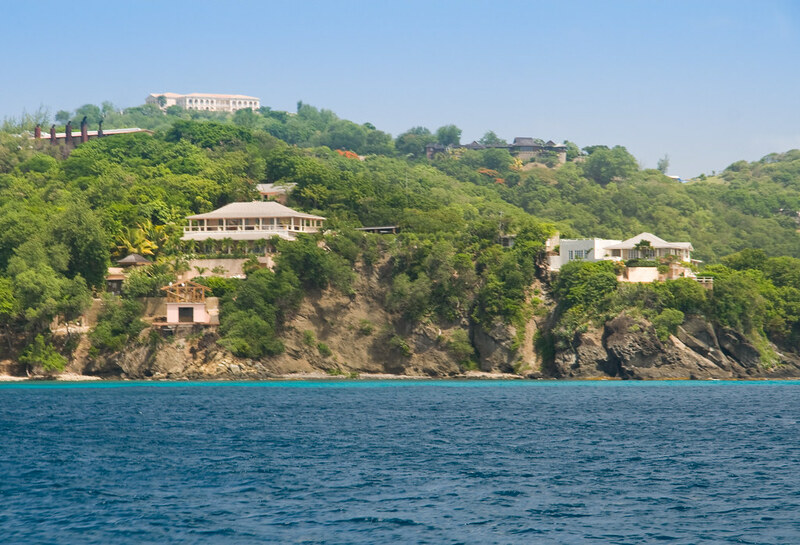 It is a private island, owned by the Mustique company, stretches across 2.2 square miles, and has a population of 500. Rocky headlands, pristine beaches surrounded by palm trees, clear, turquoise water and steep hilltops are all you can see. It is considered one of the most exclusive destinations thanks to their luxurious accommodation options and the privacy guests can enjoy here. An overview of the Macaroni beach, the island’s most popular beach. David Bowie who sold his villa to publisher Felix Dennis. Farida Khelfa, her husband Henri Seydoux, and his daughter Lea Seydoux. Queen Elizabeth II and Price Phillip. Cheryl Cole who had her wedding here. 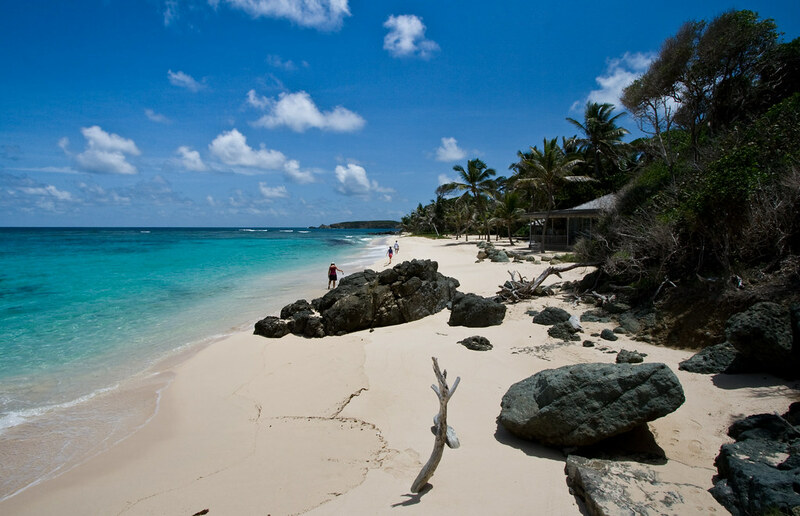 Mustique has a gentle climate all year around, but the peak season is between December and April. Its rainy season lasts from May until November and, although significantly more tempered than in other tropical destinations, short showers can still be observed during this season. However, they never last long. If you want to enjoy the beauty and serenity of this place at lower rates, this is the time to visit. There are no direct flights from the U.S. to this island. To get here, your only option is taking a commercial route to Santa Lucia or Barbados and go on from there. The company that owns the island organizes regular charter flights with their owned or rented aircrafts. A flight from Santa Lucia takes about 30 minutes, while one from Barbados can take 45. During this time, passengers can admire the Grenadine archipelago and enjoy a drink. However, these flights come with the same basic flight regulations for passengers. Costs for an adult ranged at the moment of writing between $US 400 and $US 650. These fees include a single piece of luggage of up to 44 pounds per passenger. Additional pieces will be charged extra, and visitors who bring heavier pieces will need to carry these themselves. Among all Mustique hotels, this one is by far the most famous. The Cotton house is a luxurious hotel with 17 large and airy cottages, bedrooms, and suites. Each of them has a private veranda and a plunge pool and are surrounded by tropical vegetation to enhance privacy. Even though beaches, restaurants, and bars are a few minutes away, the atmosphere is quiet and relaxed. These are highly recommended for larger groups who want their privacy, or for families with children. Tanama, Paradiso, Les Jolies Eaux, Sapphire, or the Macaroni Beach House are just some of the villas available as rentals. Most have 3-5 bedrooms, but smaller lodges or larger villas are also available for rental and even sale. The shores of Mustique island are not only great for taking in some sun and fresh salty air or adventuring into the clear, turquoise waves. Every gulf and beach has its own traits that make it suitable for different activities. 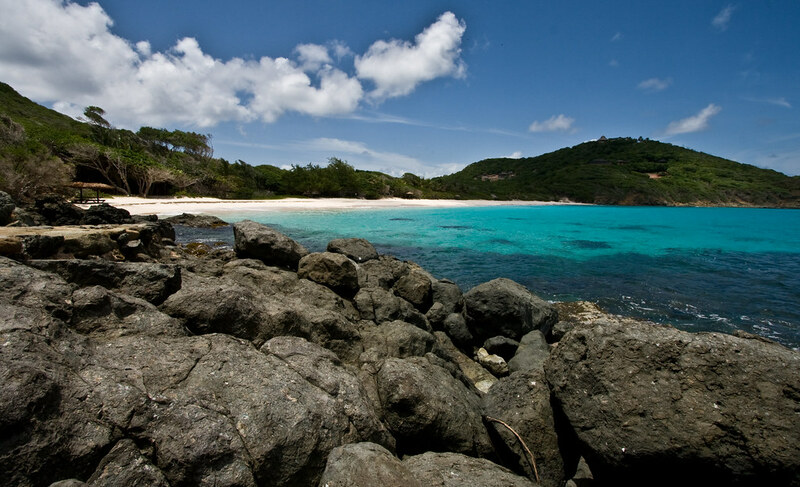 These 3 beaches are located on the southern and western shores of the Mustique island. They are ideal for families with children, inexperienced swimmers, or those who are just looking to relax in the sun. the waters in this area are calmer and great for activities like snorkeling or paddle boarding. Located on the northern shore of the island, these 2 beaches are great for experienced swimmers and aquatic sports enthusiasts. Macaroni beach is by far the most popular one, a trademark of the private island and visited by countless celebrities every year. Although swimming and lounging on the beach all day sound like the perfect vacation, there are many other things to do on this secluded island. Most of the restaurants on this exclusive island are Michelin rated or have famous chefs. Hence, it’s safe to say the dining experience is exquisite at least. The Cotton House restaurant and Veranda restaurant cover every specific you can think of, from traditional Caribbean to European or Asiatic dishes. The Great Room bar, Beach Café, Ice Cream Parlour, Basil’s Beach bar, and the Firefly are specialized in delicious alcoholic and soft drinks, but also serve snacks or pizzas. Parties here go long into the night, so they’re the perfect choice for party goers of all ages. Music festivals and other events are regularly organized on this island. Many say you can’t go to this tropical paradise without enjoying a barbecue by the fire on the beach or adventuring towards the center of the island and enjoying a picnic. But don’t think you will need to work your way to eating! Your villa’s or hotel’s chef will handle everything for you. There’s no better way to explore the shores and hills of the Mustique island than on horseback. You can gallop through deserted beaches or trek up into the island’s hills until reaching its peak points to enjoy a stunning view. Children can particularly enjoy the 3-day camp during the high season when ponies are available for riding. During these camps, children will also learn how to care for an equine and manage a stable. All of these are available from the Endeavour Bay, but preparations can be made to have them delivered to a location of your choice. And if you don’t want to venture yourself into the unknown, you can simply float around in a glass kayak and observe the marine life in the above reefs while taking in the tropical sun. It doesn’t matter if you’re experienced or just learning how to pull the ropes of sailing. Here, the waters are so calm even children or those who never stepped on a boat before can successfully handle a small watercraft. Sailing lessons and classes are also available from the Endeavour Bay. And if you find yourself at sea, you can also try your luck at fishing. There’s no need to worry about tackle or fish populations. Locals will provide everything you need and they closely work with environmentalists and government agencies to make sure populations are under control. The 4 floodlit omni-courts and 2 floodlit hard tennis courts are very popular among Mustique visitors. For those staying in hotels or lodging of the company who owns the island, this activity is complimentary. In addition, experienced players can participate in seasonal championships and tournaments during the high season while beginners can take lessons all year around. Hey Buddy!, I found this information for you: "Mustique, The Island of Celebrities". Here is the website link: https://caribbeansbest.org/mustique-island/. Thank you.